If you are ready to spend $799 that Nvidia GeForce RTX 2080 GPU demands, you won’t come away disappointed. The incredible and exceptional features and technological architecture provided in this graphics card make it one of the best and top-quality GPUs for serving high-end gaming purposes. The demand for gaming laptops is increasing day by day among the youths of today’s generation. With this increasing demand, nowadays, the games in the market are so versatile that there is a need for updated gaming laptops. In any gaming laptop, the graphics card is one of the important and essential pre-requisites. A graphics card also known as GPU plugs into the laptop and manages specialized computations related to computer graphics. So, high-definition games cannot be played on a laptop unless it possesses a highly configured graphics card. There are many companies who manufacture different varieties of GPUs at varying ranges. Nvidia is considered to be the best and most popular designer and manufacturer of Graphics Processing Units for gaming and professional markets. 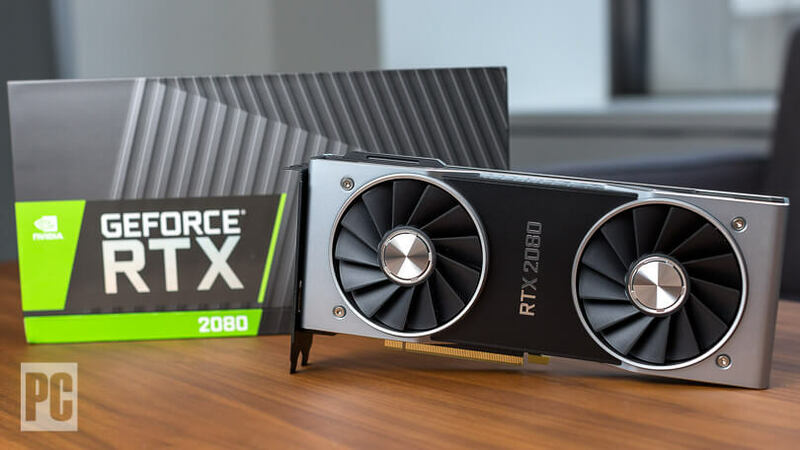 In 2018, Nvidia launched its first product from the GeForce RTX series named as Nvidia GeForce RTX 2080. However, Nvidia GeForce RTX 2080 is pretty expensive with respect to other GPUs manufactured by other companies. Also, the said GPU consumes a comparatively higher amount of power with respect to the almost similar types of graphics cards. However, the high-end performance provided by the RTX 2080 GPU justifies its high cost. If you are looking forward to buying Nvidia GeForce RTX 2080 GPU, then it can turn out to be the best option for enhancing your gaming experience. Before you go ahead, you need to collect sufficient information regarding this GPU. 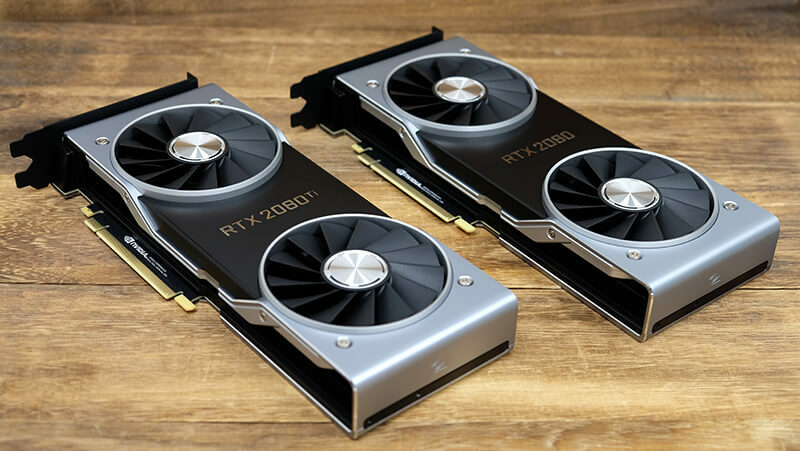 In this guide, we are going to compare all the features and specifications of the RTX 2080 GPU and provide a short yet informative Nvidia GeForce RTX 2080 Review. As we were slowly getting over the expenses of Nvidia GTX 1080, a noticeably more expensive GPU than its predecessor, the RTX 2080 was launched with a higher price of $799. Basically, it is worth of the Founders Edition for this generation, which are the high-end versions of Nvidia’s GPUs. However, a comparatively low-cost GPU was released by Nvidia with lesser configurations at the price of $699. This model of graphics card was known as the Nvidia GeForce RTX 2080 Ti. Nevertheless, if you intend to buy a less expensive graphics card, then you can opt for AMD Radeon RX Vega 64. But you won’t get the similar high-end features of Nvidia GeForce RTX 2080 in any other GPU. So, the extraordinary and exceptional configuration and performance of RTX 2080 justify its high cost. As a onetime investment, RTX 2080 would be the finest options available amongst the other GPUs present in the market. Manufactured by Nvidia, GeForce RTX series graphics cards are provided with the Turing GPU architecture along with the all new and trendy RYX platform. It enhances the performance of the previous-generation GPUs up to 6-times. Nvidia GeForce RTX 2080 ushers the power of real-time ray tracing and artificial intelligence to modern games. Now the question comes, what is ray tracing? The mechanism of ray tracing refers to a definitive solution for life-like realms. It includes life-like lighting, reflections, shadows and other visual effects thereby facilitating a higher and modern level of realism. This kind of life-like realism has not been provided by any other GPUs till now. It has a wide approach in gaming and professional markets which is far beyond the possibilities rendered by traditional techniques. Also, the Nvidia GeForce RTX 2080 GPU provides the facility of high-quality AI mechanisms. In today’s world of machinery, artificial intelligence is one of the driving forces of technology advancement. In the history of the massive progress in the domain of science and technology, AI has made a huge contribution. The Turing architecture formulated by Nvidia has brought this feature of AI to computer graphics. The architecture is armed with Tensor Cores that offers AI computing horsepower and using this mechanism Turing based GPUs can run powerful AI algorithms so as to produce exclusive outputs. In real time, Turing architecture can operate on these AI algorithms to create clear, crisp and life-like images. Also, the special visual effects presented in modern games are possible because of the implementation of AI in the GPUs. The Founders Edition based graphics card of Nvidia GeForce RTX 2080 is provided with a next-gen 8-phase power supply so as to achieve maximum overclocking. The factory overclocked GPU also comes with dual-axial 13-blade fans associated with a new vapor chamber for acquiring ultra-cool and quiet performance. The Programmable shaders present in the RTX 2080 GPU define modern graphics. The Turing architecture based GPU features, recent and modern advanced shading technologies provide more power, flexibility and efficiency for high-end gaming purposes. In association with GDDR6 8 GB memory, the Nvidia GeForce RTX 2080 graphics card lets you tear through games with maxed-out settings and immensely high frame rates. Besides the above-stated technologies, other modern technologies are also used to facilitate Virtual Reality (VR), VirtualLink and USB Type-C features. The Nvidia GeForce RTX 2080 GPU is surely more expensive than its predecessors, but its superior performance makes up for the price bump. 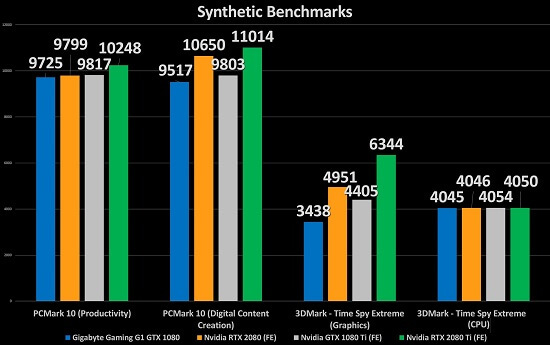 The said GPU performs much better than the GTX 1080 with remarkably higher benchmark scores. The Nvidia manufactured RTX 2080 even beats the GTX 1080 Ti and Titan XP in terms of high-end performance. Using the GeForce RTX 2080 graphics card, you will also see an enhancement in the performances of the games that you play. The 4K display together with add-on features makes the RTX 2080 a remarkable Graphics Processing Unit in the modern days. At 4K the Nvidia GeForce RTX 2080 shows as high as 60 frames per second (FPS). This feature creates a great milestone in the performance of the RTX 2080 GPU. Besides, the RTX 2080 GPU has also managed to acquire 40-FPS while playing the Shadow of the Tomb Raider game at 4K in highest possible settings. With similar arrangement and at 4K, the game Destiny 2 produced a better rate of FPS, hovering between 60-70 FPS. 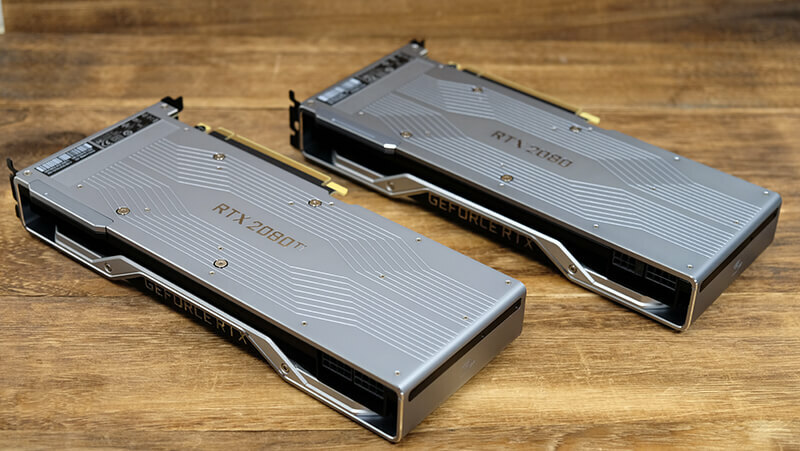 Thus, it can be observed that Nvidia GeForce RTX 2080 GPU is one of the best and versatile graphics cards delivering high-end performance. From the above said detailed discussion on the design, specifications and performance of Nvidia GeForce RTX 2080, it can be concluded that this GPU is one of the dedicated and versatile GPUs highly beneficial for any gaming laptops. The high frame rate at ultra-HD and 4K resolutions make the graphics card an exceptional and incredible GPU available in the existent market. The Real-time ray tracing mechanism together with AI facilitates a wide range of visual effects in various games. Also, the exclusive feature of Virtual Reality enhances its uniqueness in gaming and professional markets.